An excerpt from the Nobel Peace Prize (1979) acceptance speech of Mother Teresa of Calcutta: "I choose the poverty of our poor people. But I am grateful to receive (the Nobel Prize) in the name of the hungry, the naked, the homeless, of the crippled, of the blind, of the lepers, of all those people who feel unwanted, unloved, uncared-for throughout society, people that have become a burden to the society and are shunned by everyone." 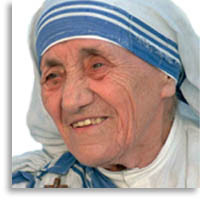 Mother Teresa was born and baptised Agnes Gonxha Bojaxhiu in Skopje, Macedonia. Her parents were Catholics from Albania. When 12 years old she experienced a religious vocation. Six years later she joined The Sisters of Our Lady of Loreta , taking the name "Sister Teresa" after Saint Teresa of Lesiux, patroness of Missionaries. After studies in Ireland, she finished her training in India. In 1937, she made her final vows and was appointed to be the head of a secondary school for middle class girls in the centre of Calcutta. However the constant presence in India of desperately poor and dying people deeply affected her. On the 10th September 1937, she departed for a religious retreat in Darjeeling; "The most important journey of my life", she said afterwards. God, she felt, wished her to leave her convent in order to live with and help the poorest of the poor. "It was an order, a duty, an absolute certainty." In 1948, persisting with this new vocation, she received permission to leave the Loreta community under the condition she retain the vows of poverty, purity and obedience. Henceforth her life was spent living amongst the "poorest of the poor", wearing a cheap white and blue sari and putting into practice the education the Church provided. Indian women came to join her in her care for unwanted street dwellers. In 1950, the "Missionaries of Charity" (Sister Teresa's new sisterhood) began. In 1952 a House for the Dying opened. Five years later the Missionaries of Charity begun work in many disaster areas of the world. In 1970 Mother Teresa was awarded the Pope John XXIII Peace Prize and in 1979 the Nobel Peace Prize. She died in 1997.